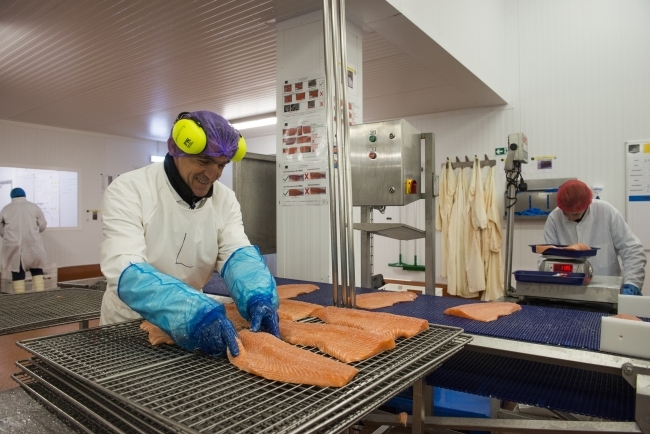 Salmon producer Marine Harvest VAP (UK) has achieved annual energy savings of £21,000 after Atlas Copco updated its compressed air system with new technology. By downsizing from a 45 kW compressor to a GA22VSD+ rotary screw compressor from Atlas Copco, the salmon producer has realised a 76 per cent energy saving and a 30 per cent reduction in service costs. The more compact compressor has also freed up floor space to fit a new refrigeration unit for an additional kiln. Atlas Copco conducted an iiTrak audit to identify possible energy and service savings. The audit confirmed that the existing compressor was significantly oversized relative to the current and predicted future production demand. The compressors were originally installed as the principal operating power source for pneumatic production demands. This experience is not uncommon within industrial applications when system audits compare output, performance and costs of an ageing compressed air supply with contemporary and precise process needs. Advances in compressor technology and performance now make it possible to specify machines with lower kW ratings to replace oversized, older equipment, often installed on a ‘one size fits all basis’. 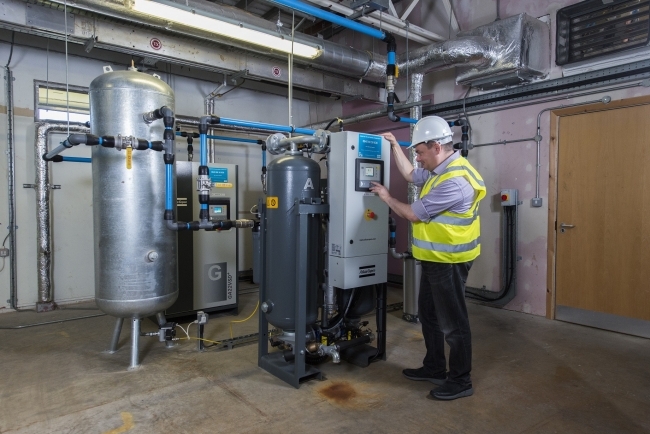 As a result of Atlas Copco’s recommendation for Marine Harvest’s replacement system, a compact 22 kW GA22VSD+ rotary screw compressor and BD desiccant dryer were installed, not only to deliver a dry 8–10 bar air supply but to provide other significant benefits, including energy efficiency. 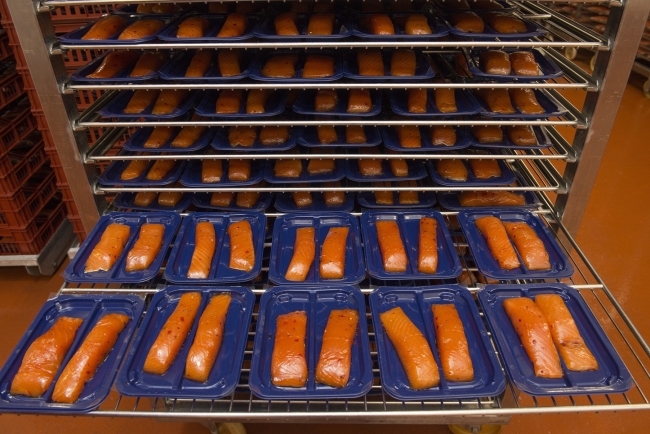 Furthermore, there is sufficient capacity in the new compressed air system to allow for additional loading and, ultimately, cross-connecting with an identical system that is planned for the Rosyth based company’s plant expansion. This will provide additional compressed air production and essential equipment redundancy to safeguard increasing production demand. Marine Harvest VAP has also benefited from the compact dimensions of the new compressor and its vertical design. This has recovered floor space, which was used to install a refrigeration unit for post-cycle cooling of the plant’s newest fish smoking kiln. Moreover, in keeping with its green energy initiatives, the company is planning to use the remaining floor space to install an Atlas Copco ThermoKit. This will enable recovery of compressor waste heat, to help pre-heat the factory’s process water supply. Atlas Copco’s GA Variable Speed Drive+ (VSD+) automatically adjusts the motor speed to match the compressed air supply to the air demand, thanks to its integrated inverter unit. When combined with the innovative design of the iPM permanent magnet motor, corresponding to IE4 efficiency levels, and a close-coupled drive train, the installation produces average energy savings of up to 50 per cent.